I’m knitting away on my Pie Are Square shawl. I’m nearing the end. I’m so close I can taste it. Except I’m nowhere near the “end” because I’m not going to do a bind off. I’ll be knitting on a lace border. The Pie Are Square shawl is a three-quarter circle with two front panels. It ends with a long edge that’s currently at 750(ish) stitches and getting bigger every other row. If you’ve ever made a shawl with very long rows like that then you probably know that the bind off can be troublesome. Its hard to get the tension on the bind off edge to match the drape and stretch of your shawl (or dress, or blanket). Well a good solution to that is not to bind off at all. Knit on a border instead. Plus knitted on borders have the advantage of being attractive elements. There are all sorts and styles from simple to amazingly complex and you’ve probably come across them in books. All of these are knit from side to side. Those laces above? The cast-on edge is on the left; bind off edge is on the right. Lace edges work up in strips and they can of course be as long as you want them to be. There seems to be a common misconception, and its a very understandable one, that these laces are only worked as strips. That they are for knitting up and then sewing on to something. They can be used that way. But they can also be used as a finish-off edge and there is no sewing involved. 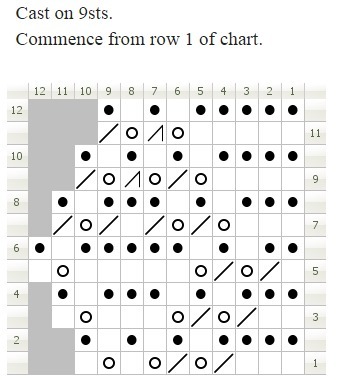 1) Begin at the end of a Right Side Row. That usually means cutting the working yarn and sliding/slipping the stitches back. 2) Join in new yarn (probably) and cast on the number of stitches your edge pattern calls for. 3) On the Wrong Side, knit back. This is a set up row. 4) Before you turn, bring the working yarn to the front and slip one stitch from the body of your knitting to the right needle. 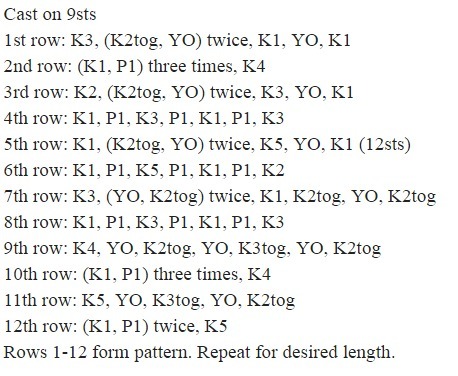 6) You should be on the Right Side of the knitting. Whatever your edge pattern tells you to do for the first stitch, ignore it. Instead work a k2tog. That will join the edge to the body. 7) Pick up with the second stitch in your edge pattern and follow as written to the end of that row. 8) Turn to the wrong side; follow all instructions. When you reach the end… bring the working yarn to the front. Slip a stitch from the body. Then turn. 9) K2tog. Pick up with the second stitch in the next row. Here is the video version for all that. Like the edge I’m using ? Me to. I was going to use the Godmother’s Edging from 2nd Treasury (shown above) and then I found this little gem at knitting-and.com. Its called Diamond Edging and there are written and charted instructions. But this isn’t their only edge pattern. They have a very nice selection of lace edges, all free patterns. I’m pretty sure they have something that you’ll like. And these instructions will work for any side-to-side edge pattern not just the one I’m using. So you can take one and knit it up by itself or as a knitted on edge. I do like this way of finishing off a long row/round of stitches. 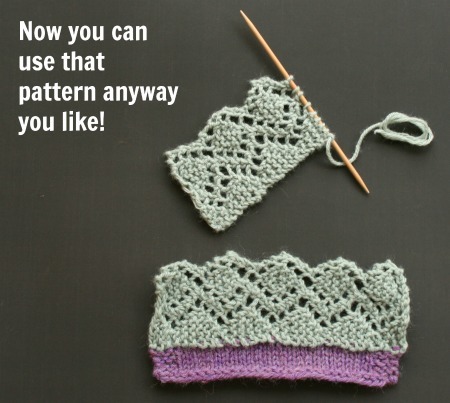 A bind off that is made too tightly will ruin the look of a project. I can’t tell you how many lovingly made Color Affection shawls I’ve seen that don’t hang or drape right because the bind off edge (which is really long on that pattern) doesn’t spread and open the way the body of the shawl does. A knitted on edge, even a very simple one, will spread out the way you need. Its sideways and usually garter stitch so it has the capacity to expand or scrunch to match the body of your knitting. I don’t know why the books that include these strip patterns don’t include instructions for using them as knitted on borders. I don’t know why more designers don’t put them in patterns. But don’t let that stop you. Any time you want a fancy edge… knit on! Like free tutorials? I got more. Enjoy! 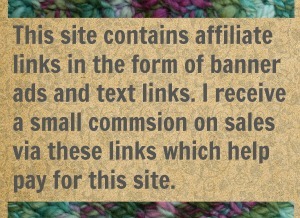 19 Comments on "Knitted on Borders and How to Make Them"
What a great idea!!! Don’t know that I am of such skill but a really good idea!!! 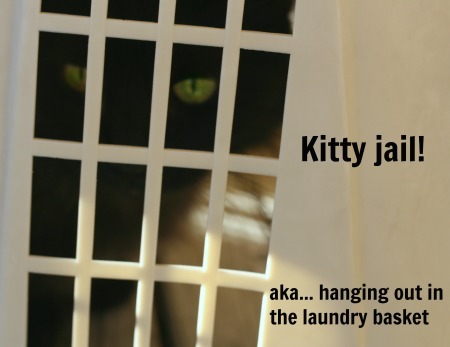 I betcha you could make this work. 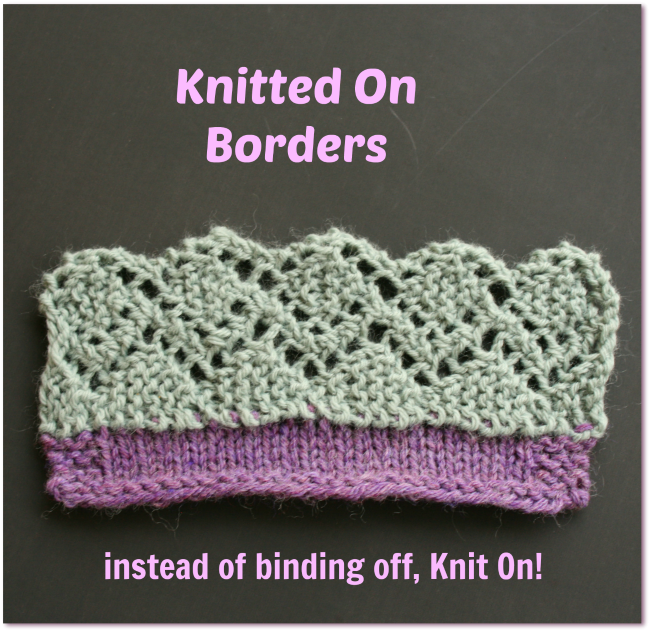 The knitter on border is only as complicated as you want it to be. Very beautiful. I like that lace. Its quite a little gem and I quite like it. I suppose that any pattern which stay in use for a century or so is a good ‘un. 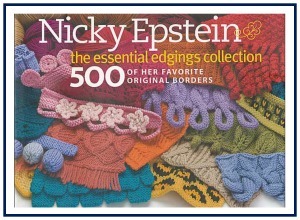 I got hooked on edgings when I was making fingerless mitts for my daughter, who works I. An office that apparently thinks 60 is a normal working temperature. I made her mitts with lace edging on a cuff, and she loves them. I got the Epstein book at our library’s garage sale! Brr! I might die if I had to working a place that cold. Die or toughen up. I Love Nicky’s edges. I have her Knitted Embellishments book and it comes with a chapter of edges. Some of her stuff is familiar but some of it is very unique. And I just like her design aesthetic. She usually makes stuff I could see myself in. I love this technique! Thank you so much for introducing me to it. I can’t wait to try it. I know that should be able to figure this out but I just can’t visualize it: if I’ve knitted something in the round using magic loop, how do I apply this technique? I’m thinking that I’d I’d to try this on the cuff end of toe-up socks. That is really interesting, and I’m glad you made a video so I could really understand what you were doing! I’ve thought of adding a lace edge to a project, but thought it would be done by picking up each stitch on a finished edge. Using this on live stitches instead of a cast-off to make an edge nice and stretchy is brilliant.